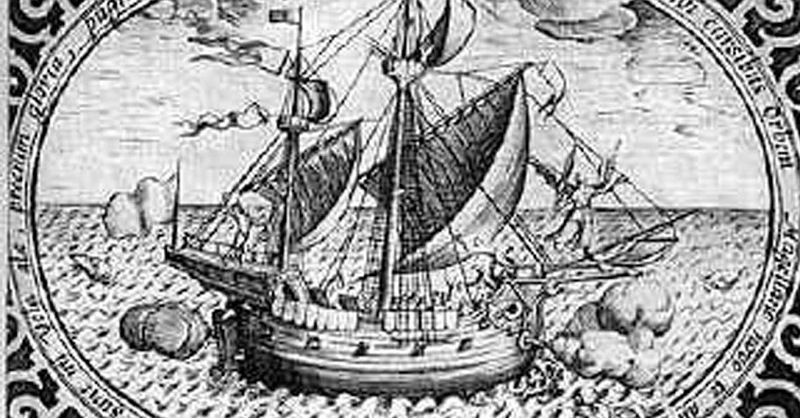 After leaving the coast of Tulay early one day around the third week of May in the year 1570, Martin de Goite and his expeditionary party to explore Luzon pushed on and arrived in Manila Bay in the afternoon of the same day. His instructions from the governor, Miguel López de Legazpi, were to make peace and win friends in Manila. Word of this got through to the Spaniards, reported by relatives of Soliman’s own warriors. What transpired next is really outside of the scope of this narrative. Suffice it to say that fighting did break out, resulting into many deaths to the natives and the Spaniards burning down their towns. Soliman himself had to flee for his life. Wary of the arrival of the southwest monsoon, which would have made it impossible for the larger ships2 to return to Panay, de Goite made the decision to sail out of Manila Bay rather than pursue Soliman and his men. He sent the injured Juan de Salcedo, still not recovered from the arrow wound he received in the Bonbon Lake area, ahead to Panay in the junk San Miguel. De Goite himself preferred to stop off and stay with the oared praus for a few days in the town of Balayan. He did so “in order to win over all the towns which were desirous of peace.” Earlier, on his way to Manila, he had already established friendships with the chiefs of the town of Balayan as well as those along the coast of Tulay. He finally left for Panay after having been summoned back by de Legaspi. Word also reached him that three ships sent by Don Martin Enriquez, Viceroy of Nueva España3, under the command of Juan de la Ysla, had arrived. De la Ysla brought with him letters from Felipe II, the King of Spain. The repartimiento (meaning division or partition) pertained to the system enforced in Spanish colonies whereby natives were allotted to Spanish settlers as cheap or unpaid labour, but not as slaves. It was seen as a replacement for the encomienda system, which had been abused by Spaniards in their colonies. The latter was no different from the feudal system in Europe whereby monarchs, unable to defend the expanse of their domains against the advance of barbaric tribes, delegated defence of their lands to the nobility. Essentially, the nobility was in charge of the protection of the inhabitants of their lands; and in return, was entitled to collect levies from them. In the Spanish encomienda system, natives were technically assigned by the monarch, but in reality by his representatives, to Spanish settlers in the colonies. In return, the encomenderos (those granted encomiendas) received tributes from the natives ostensibly under their care. Although the repartimiento was conceived to replace the encomienda, in some colonies the two systems continued to be used at the same time. In the context of the Spanish colonisation of the Philippines, the terms repartimiento and encomienda seem to have been used interchangeably in historical documents. Because of the continuing problem with food in Panay, on 16 April 1571, a day after Easter, de Legaspi sailed to relocate his entire camp in Manila. The choice of Manila was something of a curiosity, since de Goite had left it not exactly in friendly terms with the natives. On the face of things, Balayan would have been a more logical choice since the natives had been more welcoming of the Spaniards than those of Manila. By the third day of June 1571, de Legaspi gave “the title of city to this colony of Manila9” where he had quickly made peace with local chiefs, even the erstwhile antagonistic Soliman. Those who refused to accept peace with the Spaniards, like the province of Capangpanga (Pampanga) and the village of Caynta (Cainta), he sent his forces after, led by de Goite or de Salcedo. He also issued an edict through which he declared, in the name of Felipe II, that he would be granting repartimientos “to those who desired to settle in the city of Manila.” Because of his services to the Crown of Spain, particularly in “pacifying” (“pacify” being the term used by many Hispanic documents to mean “subdue”) natives who were unwilling to become friendly with the Spaniards, the first repartimiento in Luzon was awarded to de Goite, along with a river called Bonbon. 2 It was already established in the first chapter that the expeditionary party consisted of a junk and a frigate, both wind propelled, and several praus, which could be propelled by wind or oars. 3 The viceroy was the minister personally appointed by the King of Spain to rule Nueva España or New Spain in his name. The colony was in what is now present-day Mexico. 5 Named as Martin de Rada in other documents. 7 Moros were how Spanish documents referred to Muslim natives of 16th century Philippines, after the Moors who besieged Europe in the Medieval Ages.